A manufacturer had a need to protect the components of a circuit board from salt, dirt, vehicle fluids and water corrosion. Encapsulation of the circuit board with a waterproof clear thermoset adhesive seemed a logical solution. 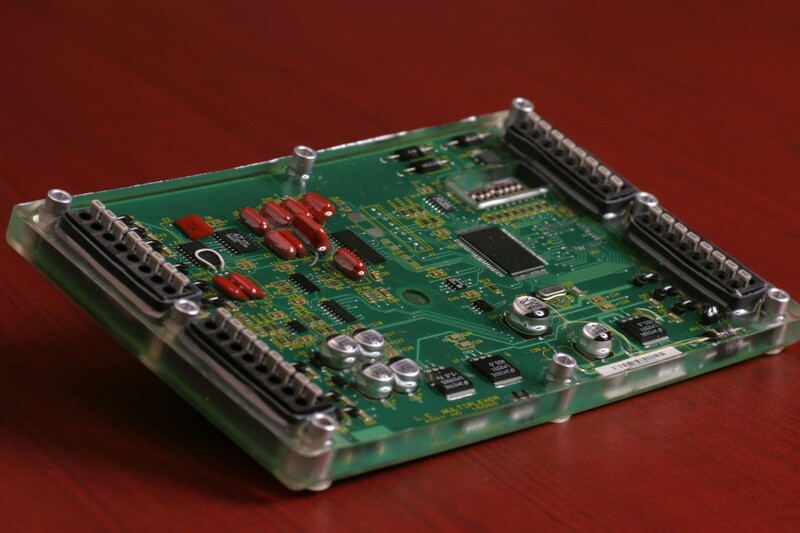 However, the original product in the field consisted of a circuit board with a conformal coating. After a few months, it became clear that the conformal coating didn’t hold up to the harsh environment. Failure rate in the field was 20%. Create a mold for the current circuit board. Retrofit the circuit board with enhancements to facilitate encapsulation. Make the mold in a way to keep the circuit board flat after encapsulation (typically epoxies shrink during cure which would bend the circuit board). Utilize an existing Appli-Tec encapsulant to protect the board from environmental exposure. In response, Appli-Tec created a mold and custom bands to seal the terminal blocks. Appli-Tec was also able to utilize a standard product for the entire board – minimizing the cost of the project. Additionally, Appli-Tec used a sealant for sealing the bands around the terminal blocks; the material would be applied only to the areas of the board most likely to leak. The thixotropic sealant was clear in the finished product, but visible during production to ensure an effective seal (a UV tracer in the material glowed when examined under black light). The combination of clear sealant and encapsulant provided an unhindered view of the circuit board’s components, which proved a valuable asset for the manufacturer and its customers. With the fully encapsulated board, the company reduced failure rate in the field from 20% to 0.2%. The drop in failures saved the company tens of thousands of dollars per month in service calls and increased customer satisfaction.